October is in full swing and we are ready with a new cocktail and snack pairing! 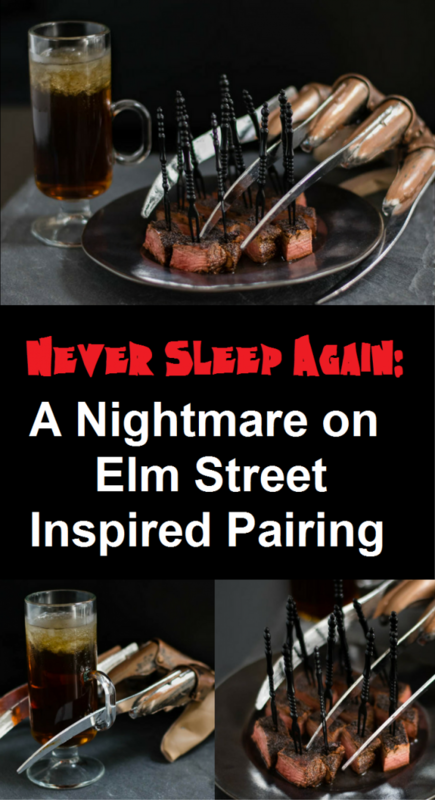 This time we are using A Nightmare on Elm Street as our inspiration. A Nightmare on Elm Street is one of our favorite horror series. Therefore, it made sense to start our foray into classic slasher inspired pairings with it. When trying to figure out what food and beverage flavors fit with the movie, we kept coming back to smokey. We wanted to do more than that so we asked ourselves what another prominent feature of the movie was. Then it hit us. Coffee. The premise of A Nightmare on Elm Street is that the characters are haunted and hunted within their dreams. Staying awake means staying safe. Below is the pairing we came up with. Both the cocktail and snack have heavy coffee influences. They also both have some sort of smokey component, mezcal and in the cocktail and cumin in the steak bites. We also wanted them to pair with one another. So we kept a more Latin influence in flavors with the mezcal and other seasonings. Later this this week we will be posting a Friday the 13th pairing! Vote for your favorite either in the comments below or using the hash tags #GWEFreddy or #GWEJason! Be sure to visit for more horror and Halloween fun! Combine ingredients in stirring glass with ice. Strain and serve in Irish Coffee Glass filled with crushed ice. Create a crust on steak with espresso rub. Grill for 5 minute a side, until rub starts to caramelize. Cut into bite size pieces. Serve with toothpicks or appetizer forks. *The Geeks were not given any comped items to facilitate this write-up; Opinions and recipe are wholly our own. View our Disclosure Policy for more info. Those steaks look yummy! I’m not a scary movie person, but I might watch it for steak! You can make them for any party! They are so delish! We even like them cold on a salad! What a fun idea — I love the mezcal, too — making it a grown-up party! I’m coming to your house! We are doing other classic slasher villains too! I love the kid friendly Halloween recipes and decor but sometimes the grown ups need fun too! Hosting a Halloween party…this is perfect! We will have a Friday the 13th pairing this week as well! This is awesome! We’ve been talking about our Halloween night movie recently, this might be the winner! Thanks for the pairings! What a clever idea! This would be great for a halloween party! Spooky and delicious! I love it! These are hilarious. 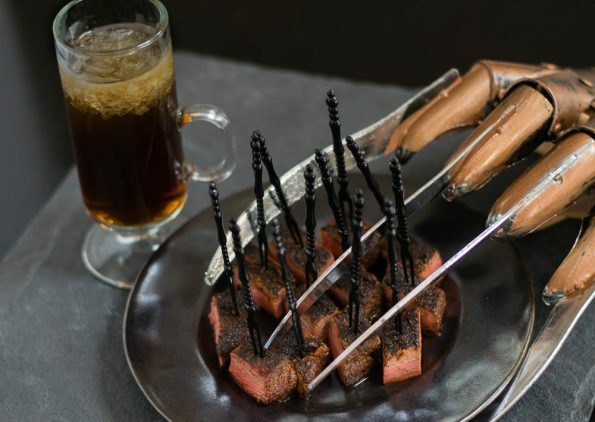 What a funny dish to serve at a Halloween party.